In the main house, this suite — named for its collectible posters of Mardi Gras and Spoleto — has two spacious rooms. Enhanced by brick floors, the sitting room with its stone fireplace overlooks the landscaped grounds and the three-acre lake. Trompe l'oeil painted "cracks and moss" on the walls almost convince you that you are outside in a café. Walnut used by the craftsman to make the cabinets for the wet bar was grown on the farm and is a perfect backdrop for the Portuguese tile countertop. Queen and twin mahogany beds, original to this bedroom, feel at home on the original old pine floors that have been whitewashed and decorated with hand painted "Delft" tiles. Enjoy breakfast on your private patio just outside your door; listen to the birds and enjoy your lake view. 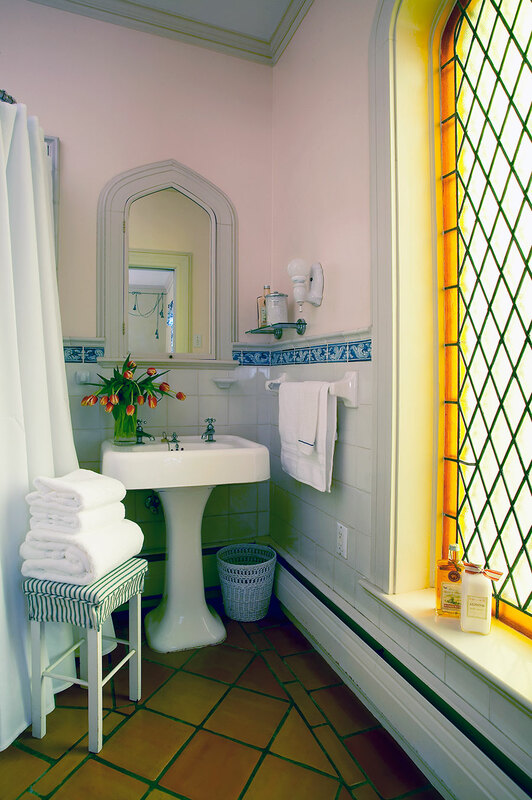 In late afternoon sunlight filtering through an antique stained glass window casts an amber glow on the Spanish tile bath and cast iron corner tub. 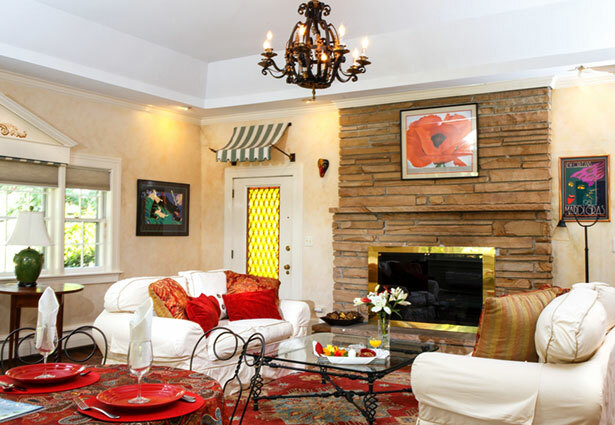 This very private, luxurious suite is the perfect romantic getaway.